A hearty pile of acorns for the NYS Conservationist magazine (which runs a terrific Facebook feed) for selecting squabbling squirrels as their weekly “caption this” contest. Check it out, and give it your wittiest best. All I want for Christmas is 11…red squirrels…a leaping? See tons more photos on the Daily Mail web site. Or, even just this one fantastic little guy, dubbed “Ginger Ninja” who can jump great distances. He’s featured in the U.K. Daily Mail. If a human could jump the equivalent distance (for our body size), it would be like leaping over a semi truck — from front to back. A useful skill indeed, but we humans are doing pretty good these days, compared to a lot of other wildlife, so we’re satisfied with just admiring the far cuter red squirrel a leaping. 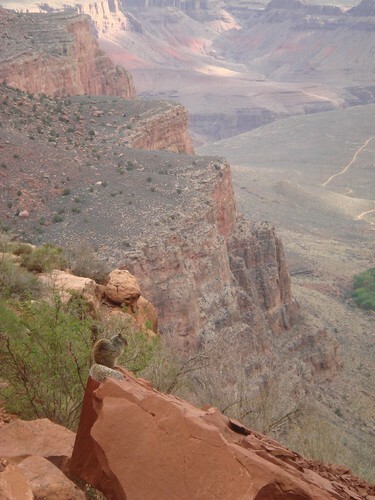 The kaibab squirrel is a white-tailed squirrel found only in the Grand Canyon region of Arizona. Today, on Squirrel Appreciation Day, the workers of the Kaibab National Forest designated more than 200,000 acres of the parks to the kaibab squirrel. In response, Squirrels Squirrels Squirrels hereby bequeaths a giant acorn to the KNF! “Dr. Joseph D. Hall, who conducted [an] evaluation on the squirrel and its habitat, stated that the Kaibab squirrel is, in a local way, as significant a species as the finches Charles Darwin studied on the Galapagos Islands. Finally: My Own Squirrel Photo!!! I love squirrels but I don’t live near any, meaning I don’t get to enjoy them on a daily basis. But this week we’re house-sitting in Coyoacan, a neighborhood in southern Mexico City. And there’s several fantastic, noisy, social squirrels roaming about the property, enjoying the lush gardens. One of them (below) looks like a typical squirrel, the other one is dark brown and has a very thin tail – not sure what species he/she is. They are having a fun time barking at my dog, who, in turn, is barking back. They’re also falling prey to my lens! The Daily Mail has an article today on Pete, a squirrel that hangs around a school in Hampshire, U.K.
Read the article to find out what may be behind Pete’s purple coat! And here are more photos. A Very Fat Squirrel – He’s Ready for Winter! How Do I Get This Snow Off My Nose?